Liza Wang (汪明荃) is well known for her perfectionist work ethic and no-nonsense attitude. Working in the TV industry for over 40 years, she has earned both respect and fear from her junior colleagues. Often labeled as a diva, Liza will soon bring her intimidating public persona on-screen in new series Elegant Transformation <華麗轉身> as a veteran superstar who belittles all those around her. To emphasize her character’s glamorous status, TVB has commissioned stunning outfits designed especially for Liza. The company also made plans to film portions of the series overseas, investing a big sum to ensure that the production lives up to its name. 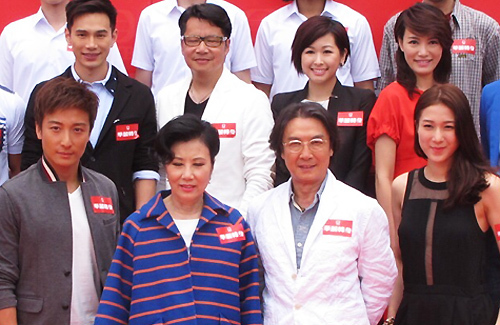 The drama also stars Damian Lau (劉松仁), Linda Chung (鍾嘉欣), and Alex Fong (方力申). Working with such a renowned actress, Alex admits that he is nervous about the unwritten rules. At the drama’s blessing ceremony on June 3, he explained, “I’m nervous. Others warned me that I must not show up late, and should even come in early because I would be considered late if I arrive after Ah Jeh [Liza]”. Liza no need to act anymore like an ‘intimidating diva’ in the drama, she just can be herself, for she is surely an intimidating ‘diva’. ‘diva’ in ‘apostrophe’ because I don’t find her to be one. No acting talent required from you, Liza. this drama sounds a bit like the devil wears prada.. Yes, its Grace Wong. Apparently, she felt the need to wear a too short skirt to stand out. It’s not a short skirt. Her outfit is just ugly overall. Their clothes, all of them… god awful! Linda as a fashion designer again? Too bad Michelle Yim is only guest-starring as Damian’s wife. From what I read, Linda is a personal assistant. Not a fashion designer. Just that she will wear fashionable outfits. In a more detailed news, it states Linda is a fashion designer. For sure next year Best Actress will go to Liza Wang. Others can forget about winning the Best Actress Award. Its funny contrast looking at the 2 ladies in the 2nd row. The one is black doesn’t bother to angle her face to make her look slimmer while the one in read purposely positioned herself to face away from the camera so they can catch her “good” side. Thought this drama was about swimming before LOL! I love Liza Wang…bring it on. Punctuality (or at least if most people get it close to time) and NOT LATE all the time, that’s work ethics. When one is caught off guard by something unexpected, then it’s ok to be late.